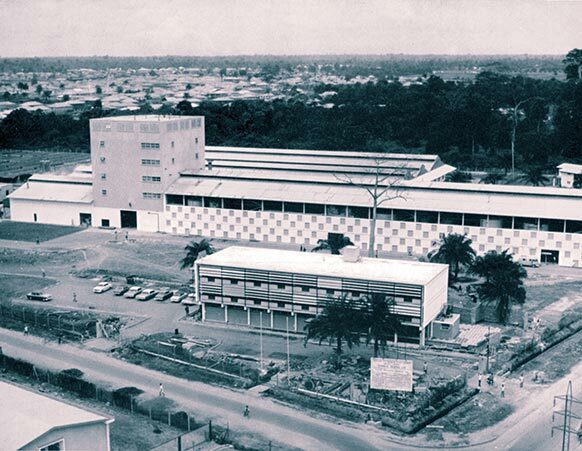 General view of the new Guinness Brewery at Ikeja, Nigeria, 14 miles from Lagos. Most buildings are of simple rolled steel and tubular framed construction except for a purpose-built brewing tower. The largest brewery that has ever been built abroad by a British firm is the new Ikeja brewery of Guinness (Nigeria) Ltd. This is the third Guinness brewery to be built during the 200 year history of the company, the others being in Dublin and London. The Dublin Brewery is in fact the largest single exporter of beer, ale and stout in the world with an overseas sale of over 2 million half-pint glasses per day. Exports have risen from well over £1 million in 1951 to nearly £5 million today and Guinness is sold in 125 different countries. Located on a 14-acre site, some 12 miles from Lagos, the Nigerian brewery was built at a cost of well over £2 million and is designed to produce 150,000 barrels or 75 million bottle of Foreign Extra Stout per year. Racking and storage vessels. The brewery is designed for the production of 15,000 barrels of stout per year. General view of the mash tun stage. Steelwork is extensively used to support the special brewing equipment. Light steel roof trusses support the brewery’s corrugated aluminium roofing; the plant incorporates the most modern brewery controls. Most of the brewery and bottling buildings are of simple rolled-steel section and tubular-frame construction roofed with corrugated aluminium sheeting. The bottling hall is a triple-span structure, two spans of 50 ft. and a third of 66 ft. 8 in., with an overall length of 333 ft., and a height of 20 ft. 6 in. It is designed to allow future extensions and will cover a floor area of 55,550 sq. ft. The brewery building is a double-span structure, with spans of 66 ft. 8 in. and an overall length of 500 ft. One span, the services building, rises to a height of 32 ft; this span incorporates the tower. 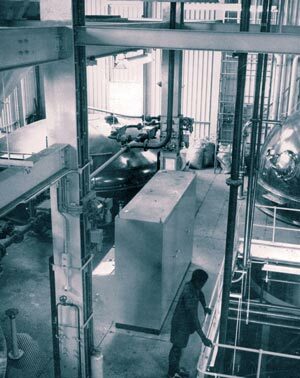 The fermenting section and brewing tower is a purpose built unit to accommodate the particular Guinness brewing vessels. The brewery building has a total floor area of 62,000 sq. ft. Steel roofs covering some 5,000 sq. ft. are also used for the locker rooms and canteen. Materials and equipment used included 5,000 cu. yds. of concrete, 200 tons of mild steel reinforcement, 880 tons of structural steelwork, 19,000 sq. yds. of flooring and 1,000 tons of mechanical plant and tanks. 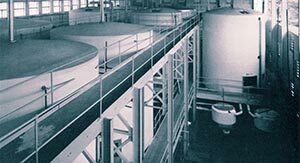 All the brewing and fermentation vessels necessary to produce Guinness, such as mash tuns, coppers and skimming and liquor vessels, were manufactured at Burton-on-Trent and Tournai in Belgium. The plant also incorporates the most up-to-date automatic equipment. 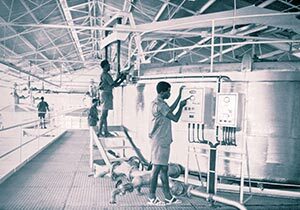 The bottling plant includes two bottling lines, which together handle up to 30,000 bottles per hour. The installation of these lines is the largest of its kind in West Africa. Six ammonia refrigerating units have been installed, each rated at 1 million B.t.u.’s per hour when producing chilled alcohol water at 40°F. Provision has been made to increase the capacity to meet expansion of the brewery. The main supply of electricity enters the brewery at 11,000 volts where it is transformed through the brewery’s own three 1,000 kva transformers to a 440 volt 3-phase distribution system. During the initial stages of operation the electrical maximum demand will be about 1,200 kva. To ensure uninterrupted supply to the essential processes, when the main supply fails, a 300 kva auxiliary generator has been installed and coupled to a ‘maintained services’ panel. The water consumption is approximately 250,000 gallons per day which will be supplied by the local authority, and to have uninterrupted supply of this external resource a large reservoir has been constructed to hold one day’s requirements. In addition a borehole pumping installation has been installed, the borehole having a yield of 10,000 gallons per hour.